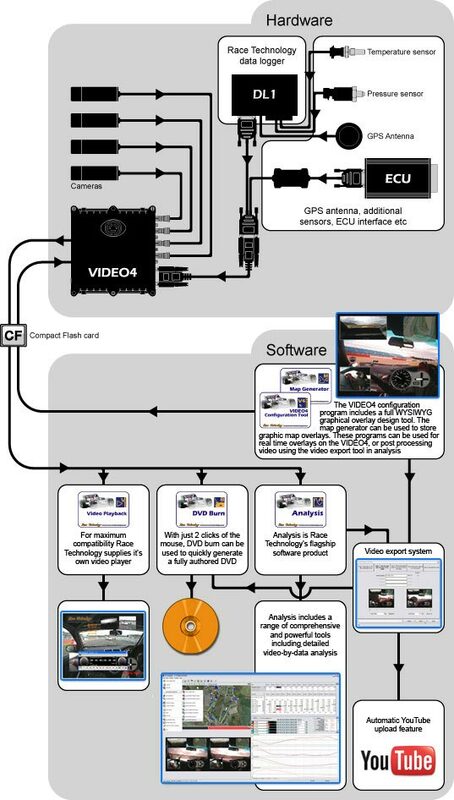 Video support is completely integrated into the Race Technology software suite, this page is intended to be a very high level guide of how to use the software and how the different programs work together. To simply view the video on a PC then you can use the �Video playback� software. More information on this is available here. Generating a DVD without further processing can be achieved using the �DVD burn� program. More information on this is available here. To use the video for analysis along side race data (data-by-video analysis) the run file from the data logger and the video file can both be loaded into the analysis software. Information on how to do this is here. Typically the VIDEO4 is used to record video and add a full graphical overly in real time, however it is sometimes more convenient to record �plain� video and add the graphics overlay afterwards. This can be done by firstly loading in the data and the video file into the analysis software as described above, and then exporting a video. Information on how to do this is included here. Note that the graphics overlay is designed in the �VIDEO4 configuration program�, information on how to do this is included here. The analysis export tool also has the option to automatically upload the video to YouTube. Information on how to do this is included here. To generate a DVD of video with a post processed graphical overlay, then the video file with graphics overlay is first generated using the method described above, and then this file can be loaded into the �DVD burn� program to generate a video. Information on how to do this is included here.